What is the Love GROWS initiative about? Early on we developed a concept called CLIMATE Changers – Christ Living In Me Alters The Environment – as a means of signposting what life will look like as we made room for the indwelling life of Jesus to live His life through us. It proved helpful to the community to understand that if something has life you can expect it to grow. 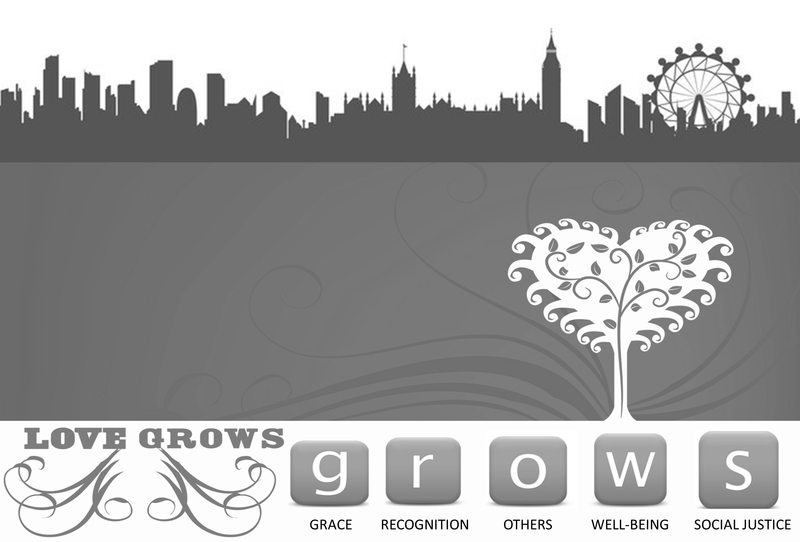 Love grows – it expands and extends its divine influence into our homes, workplaces, communities etc. If it’s true that “I have been crucified with Christ. It is no longer I who live, but Christ who lives in me” (Gal. 2:20), then it follows that we might reasonably expect “the life I [we] now live,” – which is the life of Christ – will positively impact the way we live. Not because we will attempt to imitate this new life, but rather that we participate in it. In the Autumn of 2014, we began to develop this concept further by beginning to define our purpose around a model that I call Love G.R.O.W.S. The acronym is our compass – it governs our values and guides our decision-making. When we planted our first church in September 2000, the Lord gave us a simple mandate to grow a church by grace alone, Abundant Life Church and The Grace Project were born out of that vision. Fourteen years on and thinking that our church planting days were behind us, the Lord spoke to us again. He wanted us to lead a community of believers in North West London, International Gospel Church (IGC), and guide them along the path of grace. This time, I must confess I was initially less than enthusiastic. I can claim no higher ground than the obdurate son who having said he would go and work in his father’s vineyard eventually relented and did. (Matt. 21:29). As I prayed about what our direction should be, I was struck by the sense of challenge from the Lord about helping this community to really grow, or grow up, in grace. What if we could make them a different kind of IGC – an Inclusive Grace Community? I developed a concept called CLIMATE Changers – Christ Living In Me Alters The Environment – as a means of signposting what life will look like as we made room for the indwelling life of Jesus to live His life through us. It proved helpful to the community to understand that if something has life you can expect it to grow. 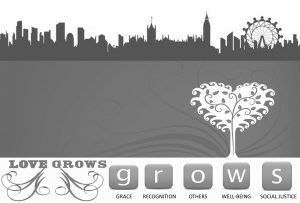 Love grows – it expands and extends its divine influence into our homes, workplaces, communities etc. Few rational people have real trouble believing that they are saved by grace – the problem is that having been saved by grace apart from works of the law many feel the need to do works of the law in order to stay saved. The Bible is emphatic on this point, “just as you have received Him so continue in him”. Simple enough, one would think, but here’s where the Betty Crocker egg phenomenon comes into play – trust me on this one. Christians are uncomfortable with the idea of not working for God. It makes them feel guilty. Let me tell you about Betty Crocker’s egg? In the early 1950’s Betty Crocker Foods produced an instant cake-mix which was destined to revolutionise life in the kitchens of middle-class American families. With the birth of this invention all the American housewife now needed to do was to add water to the supplied powder and, hey presto! However, much to the dismay of Betty Crocker Foods the instant cake mix did not sell! In fact it bombed. Why? What was there not to like? Well, according to the psychologists the firm employed, the average American housewife very much appreciated the convenience of the cake mix, but felt guilty at deceiving her husband and other guests into thinking she had worked hard for them when in fact, she had done very little work. Their answer – add an egg! By doing more than adding water, by adding a real ingredient, she could assuage her guilt. The result – sales soared! The analogy is elementary, the works of the law are to the spiritual child what the egg was to the middle class American housewife, except, and here’s the non-negotiable rub, Christ-plus-nothing-equals-everything. If you add anything to the finished work of the cross you subtract from it! Recognition begins by seeing others, our circumstances, and ourselves, the way God sees them. That, I venture to suggest, is the key to, well, just about everything. At its heart, grace is about acceptance. It’s about non-judgement. And that requires a new perspective for most of us. Especially those of us who feel it’s our duty to make things happen. We can never be anyone other than whom God says we are, or be anywhere other than where God wants us to be. However, until we know who we are we’ll forever be prone to trying to be who we think we should be. And until we know why we are here or there, we’ll forever be trying to be somewhere else. Of all my spiritual teenager lessons, this was among the most painful. It happened like this: I was in Philadelphia working on a corporate assignment. I was due to be away for two weeks and would be home in time for a very important social occasion. To my dismay, Hayley decided that she wouldn’t be attending. Her reasoning for not wanting to come was sound, but to me it was devastating! So I purposed that during the two weeks I was away from home I would use the nights to intercede in order that God would change her mind! It didn’t make it any easier, but it did at least help me to identify that Hayley hears from God too. Humility – when we recognise the value of others and the validity of their views and perspectives we realise that none of us is as smart as all of us. In doing so, we develop a healthy sense of humility, which at its heart is the ability to listen with an open mind. An open mind is one that is willing to change if presented with better information. Respect is another by-product of recognition. As love grows, our self-respect and respect for others increases exponentially. As a spiritually mature person, the teenager knows that respect is so much more than tolerance or acceptance. Too often in the religious paradigm we tolerate the opinions of others, which is to say that we put up with them even though they’re wrong – as are all who have views that differ from ours! In this context, tolerance is condescending and not consistent with the inclusive nature of love. Consistency. As love grows we begin to recognise and rectify our inconsistencies. As spiritually and emotionally immature children we are likely to compare our weaknesses against other people’s strengths, and in doing so wonder why we have poor self-esteem. Conversely, we may tend to judge others who do not live in our religious corner, comparing our best values with their worst practices. When love grows we will compare their best values with our best values and see how much we have in common, celebrating the strengths of other people and realising how together we are so much more. Sadly, so few, it would seem, attain to it. Why? Because we do consider equality with each other as something to be grasped. Ever since the fall of man we have been reaching out to take each other’s place at the top of the perceived power pyramid. One of the miserable consequences of the Fall is that while we’ve been freed from it, we haven’t attained freedom from it. Snake oil salesmen and preachers, me included, have this in common – some would say that they a great deal in common – in that they are both fond of making sweeping statements like, “what I’m about to tell you will change your life!” Whether it will or not remains to be seen, but what I can say is there is one sure way to know if you’ve changed your life – or rather exchanged your life – and that is we become other-centred. By and large, children are preoccupied with one thing – themselves. The universe, it seems, revolves around them and their needs. We are hard-wired as attention seeking devices. At the first sign that we might be overlooked or forgotten about, we bring all our considerable resources to bear. Life as a child is about me. The child has one of two default polarities when faced with the dreadful prospect that he or she might not get what they want – fight, which is driven by the underlying belief that the other person doesn’t matter – flight, which is fuelled by the thought that I don’t matter. As love GROWS we become increasingly less self-centered and more selfless – rather than selfish. How does this happen? It’s because our new nature operates out of humility, which paradoxically, doesn’t mean thinking less of ourselves, but thinking of ourselves less. Other-centredness is a critical component in our church life model. With love at the centre, informing who we are and what we do, other-centredness is the supernaturally natural way of things. Recently I was chatting with a friend who I’d not seen for some time and I asked him, “how do you take your Jesus these days?” His answer was typically witty and typically insightful, “without two lumps of church.” He is part of a growing evangelical diaspora who rather than leaving the church feel that the church has left them. There are many like him who feel that the church has slowly drifted away from its all-inclusive moorings to be carried downstream and washed-up on the shore of exclusive organised religion. It would be a mistake to confuse post-Christian with post-spiritual. While there are a growing number of people who are turning their backs on the church, the appetite for spiritual food has not diminished any more than people become less hungry during a famine. It is no coincidence that one of the most talked about subjects on Facebook and other social media is religion and spirituality. As love GROWS so does our desire for spiritual community. While we’re saved by grace through faith alone, we are not meant to live alone by faith. The expectation is that when we embrace the gospel we necessarily embrace one another. Understand that the church is no longer the somewhere you go in order to do something. In Christianity, the church is not a something, but a someone. It is who we are, not where we go! Have an other-centred raison d’être. In our community, we have two closely linked mantras, the first – It’s not about me it’s about you – is explained by the second – We’ve come not only to be blessed but to be a blessing. In other words, we focus on others and become a conduit for God’s blessing. These two community maxims speak to the heart of what we are aiming to achieve, and to what is native to us as Christ. Members of our community understand that they are looking to know more and more of Christ in themselves, and in doing so, they will see more of Christ in each other, and in everyone. I had a vision of the church being like the Cave of Adullum, it was the place where all those who were in debt, distress and bitterness of heart would leave the Saul of religion and gather to the David of grace. There, those overcome bySaul would become David’s overcomers. The Christian community is a place for healing and wholeness, a place where hearts are healed and dreams are made, and a place of wellness. Yet most of us do not come to the church as well people, we come as thirsty, disillusioned and broken people. We need to address this situation because there are far too many instances where the church has become more reminiscent of the Pool of Bethesda. If there’s one character I identify with in the New Testament more than any other, it’s an anonymous figure – one of the many nameless characters whose lives are used in such powerful cameos. That figure is simply identified as a man who had been an invalid for thirty-eight years. We meet him in the fifth chapter of John. The story concerns a healing miracle performed by Jesus at the Sheep Gate. The story is a flashing neon sign announcing the Good News of the Gospel, namely that which repels men compels God. When Jesus encounters this man, the soon-to-be beneficiary of the grace of God, he has been in the grip of his despair for thirty-eight long years. Along with his compatriots he has been dumped on the scrapheap. They’re not simply invalids as in suffering from physical disabilities, that’s only half of the problem. The real source of their despair is that they’re in-valid, as in not valid. They don’t count, they’re disqualified – they’re part of the invisible underclass. The in-valids in John’s account congregate by a pool and it’s said that this pool has curative powers. Evidently “an angel went down at a certain time into the pool and stirred up the water.” The KJV uses the intriguing word troubled. Evidently, the water in the pool is agitated. I can only imagine that the angel turned the pool into a sort of angelic Jacuzzi and whoever stepped in first, after the stirring of the water, was made well of whatever disease that person is experiencing. Now, our anonymous in-valid has been ill for thirty-eight years and my guess is that he has spent most of those empty years lying right where he is now, and has participated unsuccessfully in this winner-takes-all version of the Para-Olympics. One could be forgiven for thinking that if you’ve been there for thirty-eight years, you’d have figured out a way to beat off a load of fellow in-valids and get into the pool first. This story speaks to us about a chronic inability to seize opportunity. “Jesus saw him lying there and knew that he had already been there a long time. Jesus said to him, ‘Do you want to be healed?’” (John 5:6). Notice that it’s Jesus who takes the initiative, and not the in-valid. Stopping here for a moment, I want to pose the very same question to all of us, “Is it your desire to get well?” (Basic English Bible). It’s a profoundly important question – one that was far more important than I had realised in my own journey. Wholeness requires such a radical reframing and recasting of ourselves that it will cause us to forfeit our in-validity benefits.We’ll be expected to make a contribution to our communities – we’ll be expected to lift as well as lean. There are definite advantages to our being sick – to begin with, nothing is expected of us, nobody will depend on us. We have no responsibilities when we’re disabled. But when we’re made whole, we have no excuse! When you have been an in-valid most of your life, it’s not easy for you to see through your hopelessness and see and seize an opportunity. I’ve pondered the very same question myself and have reached the very same conclusions because I was closed off to the possibility of wholeness and happiness – Paul, do you want to be made well? I find what he doesn’t say to be revealing. He doesn’t say, “Yes, I want to be made whole”, but rather gives an excuse as to why he is unable to do something for himself. Jesus didn’t require any faith on the man’s part. He simply commanded him to stand and the man stood. The in-valid could not stand in his strength, and that’s the point! In this fast moving cameo, Jesus slipped away unnoticed, leaving the now validated in-valid standing there, sickbed on his back, for all the world to see. Why, you might ask, did Jesus make the man carry his bed? Well, in the first instance, his mat represented his past and by getting him to carry it, Jesus was intimating, “Don’t be ashamed of your past, it has made you who you are today”. When people know where we come from, our chequered histories enable us to become who we are, “… the light of the world” (Matt. 5:14) and that, my friends, is precisely how we nurture wellness in our community, by the word of our testimony. Despite all the scaremongering from our religious brothers and sisters, there seems very little evidence to suggest that the grace message leads to a life of licentiousness. On the contrary, “Your [His] people will offer themselves freely on the day of your [His] power” (Ps.110:3). Many have feared that if you take away the law from the Christian, the result will be lawlessness. But law-free and lawless are not the same thing. While fears that we will use our new-found freedom as “an opportunity for the flesh” are unfounded, it is sad that we do not always move on to, “instead through love serve one another” (Gal 5:13). Quite rightly, the emphasis in the child-phase is concerned with talking-the-self-talk but we might reasonably expect that in the teenage-phase we move on to walking-the-grace-walk, which is to “walk in a manner worthy of our calling”(Eph. 4:1), and in so doing coincidentally, “fulfil the royal law which is…You shall love your neighbor as yourself.” (Jas. 2:8). “So what?” Is one of those questions that we in the grace community need to ask ourselves, “We’re free from the law, from religious book-keeping – so what?” “We’re loved unconditionally – so what?” “We know who we are in Christ – so what?” The answer to these questions goes beyond being into doing – and that for the benefit of others? Now we need to tread carefully, just as there’s a difference between mushrooms and toadstools so there’s a difference between works righteousness and righteous works – one is poisonous the other is safe to eat. The difference is motive. The one works for acceptance and is driven by a desire to be accepted – the other works from acceptance and is compelled by love. In our community one of the first things that you’ll hear as a newcomer is, if you’re not free to do nothing, you’re not free to do anything. Visitors are surprised when they hear us say at the offering, if you’re not free to say no, you’re not free to say yes. It’s almost counterintuitive to hear us, for instance, teach against the law of tithing. For the record, I believe it’s not so much a matter of, if we don’t pay our tithe we’re robbing God (Mal. 3:8-10) but rather, if we’re paying tithes under the law of God will bless me if I do, and get me if I don’t – then we’re being robbed of God! Christians don’t pay tithes – we are the tithe! We need only offer ourselves to God and He will decide how and on what to spend us. When we do that, see how he opens the windows of heaven! In our early church planting work our emphasis was on teaching. We were a grace teaching church, but we were quick to realise that there was a growing tendency towards what I called grace pharisaism. In those days a lot of the excitement was due to the shock and awe that people who’d been under the law of performance based Christianity experienced when they heard the message of freedom – and that was great. However, I began to notice a trend. Too often the message seemed to stop at Christ in me for my benefit. Nothing wrong with that of course, but I was looking for more than that, I was looking to see Christ in me for the benefit of others. Slowly we began to see the limitations of teaching about our identity, and we began to focus on the nature of God and the way of love as the way of life. I’ve always thought that the acid test of the value of a church is whether there would be an outcry in the community – the non-church-goers – if our church wasn’t there anymore. Social justice is when people have the ability to realise their potential in the society where they live, this is the call of the church. It is a call which our spiritual teenagers have heard, and do, with no expectation of reward, nothing up the sleeve, just the love of God working in, through, and as them. Don’t you think that every church should be like this?